A delicious roasted butternut squash, red potato, carrot, shredded chicken, onion and kale broth-based soup. 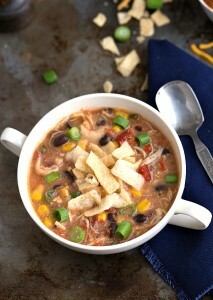 This soup is filled with tons of flavor and very healthy! Usually with soups, I like doing them in the slow cooker. My crockpot tends to be my best friend this time of the year. Dump ingredients in, wait a bit, and a delicious dinner later – sign me up! Okay, okay. Sorry. No more Christmas talk until at least after Halloween. Fine, Thanksgiving. I can wait til then… At least, I think I can. Got a bit off topic there. I can’t help it when holidays are involved! I’m kind of a Halloween-Thanksgiving-Christmas freak. I love em. (Who am I kidding..I love all the holidays!) But back on topic. Essentially, sometimes soups made on the stovetop are a wonderful thing. And eeeespecially when there are roasted vegetables. Roasted butternut squash is a huge favorite around these parts. It’s our favorite way to eat it. (Even my meat-lovin’ husband can not get enough roasted butternut squash.) And adding some carrots + red potato to the mix makes for one heck of a roasting veggie party. But the party is only getting started because all that roasted goodness gets put into a soup with kale. P.S. If you still are unsure of kale, have you tried it in soup yet? It’s amazing. Totally tender and very mild which is a great complement to the flavor bursting veggies. But it can be left out if your must or maybe even replaced with spinach. And of course, you may be wondering about a few more substitutions or recipe notes. I used chicken bouillon cubes instead of chicken broth. I like both, but the cubes are more flavor-packed in my opinion. And with a brothy, vegetable soup, a flavor pack is a must! In the recipe I call for 3 extra large cubes or 6 small ones. You can also use the chicken bouillon powder. Just follow the directions to make sure you have the right about of cube/powder to each of the 6 cups of water. The spices are also a MUST. It’s not much (only 1/4 teaspoon of each one), but they all add a ton of flavor. You can also increase any amount of any of those spices to your own preference. And salt and pepper – plenty of that along the way! Peel the carrots and butternut squash. Remove the seeds and stem from the butternut squash. Coin the carrots and cube the butternut squash. Leave the skin on the red potato and cube into small pieces. Lay out the vegetables evenly on the baking sheet. Bake for 15 minutes, then flip and stir them around, bake for another 15 minutes, flip and stir them around and bake for 10-15 more minutes or until roasted to personal preference. Meanwhile, combine 6 cups of water with the bouillon cubes. Bring the water to a boil and whisk in the cubes to dissolve. Turn the heat to low, remove the chicken breasts and allow to slightly cool. Shred the chicken and return it to the pot with the remaining 3 cups of water. Stir the kale and roasted vegetables into the broth. Add the dried herbs - marjoram, sage, rosemary, and thyme. Season additionally with salt and pepper and additional poultry seasonings if desired. I completely agree, soup is so worth the extra time. I really want to try this! I love using my slow cooker too, especially in the fall! It’s so nice to have it doing all the work for you on a lazy Sunday afternoon. This butternut squash soup sounds amazing for this time of year, Chelsea! I love all of the seasonings you added in here, I’m sure it made your house smell amazing! Pinned! This looks so yummy! Squash is one of my favorite things about Fall, and I love that this soup has lots of it! I can’t wait to try this out for myself! Gorgeous photos! I was thinking about Christmas cookies the other day too 🙂 I love this soup! 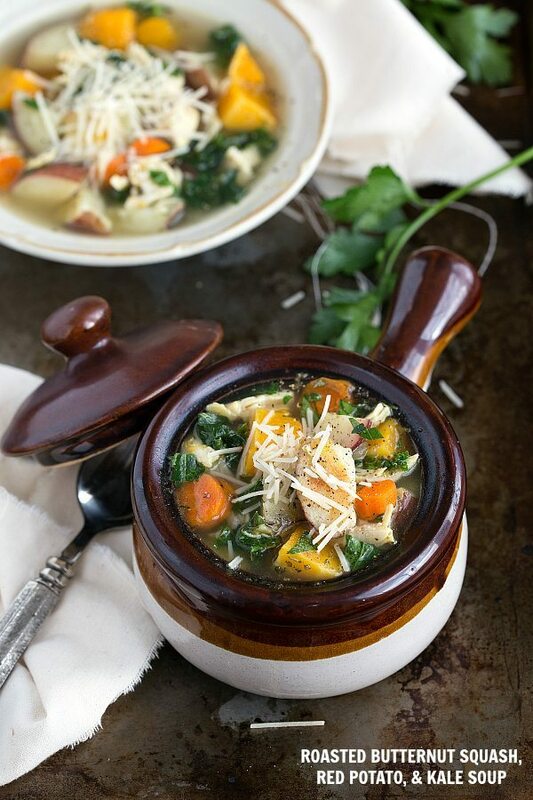 Butternut squash and kale are two of my absolute favorite veggies – so this soup is perfect! I love making a huge pot of soup and then having a healthy dinner all week long, or freezing portions to eat later! I love that you roasted the veggies before putting them in the soup – genius! This looks so delicious. 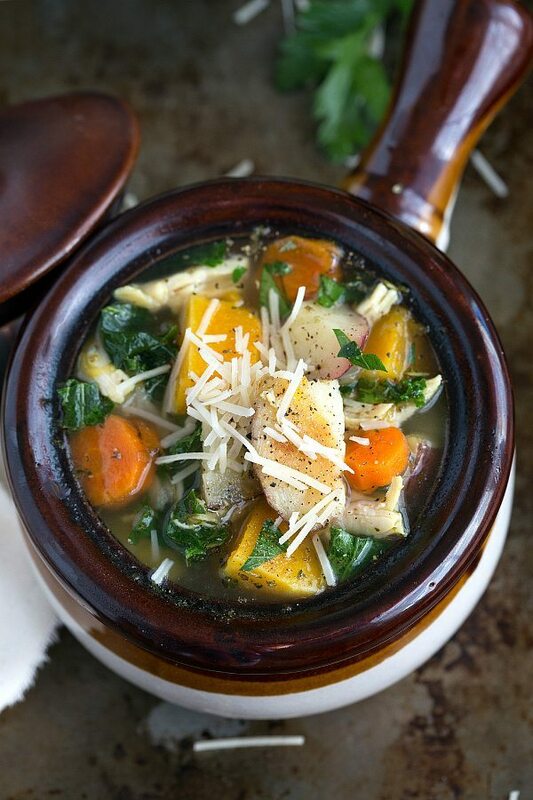 I love everything about this soup! I want one of those fancy crockpots, too. I definitely need to remember to put it on my Christmas list! There are crockpots that can be programed to turn off and on? I want one of those too… and also one with a cast iron insert so I don’t have to sear in a separate pan 🙂 This soup looks amazing and I love your bowls. I have never had kale in a soup before.. you definitely have got me curious to know what it tastes like Chelsea. 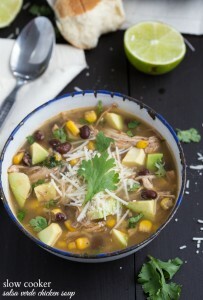 Great soup recipe and photography too! I do make soup with kale, and it is a fantastic addition to the mix. 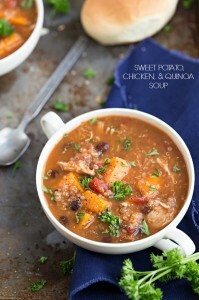 This butternut squash soup looks like the next one I will try…looks incredible! 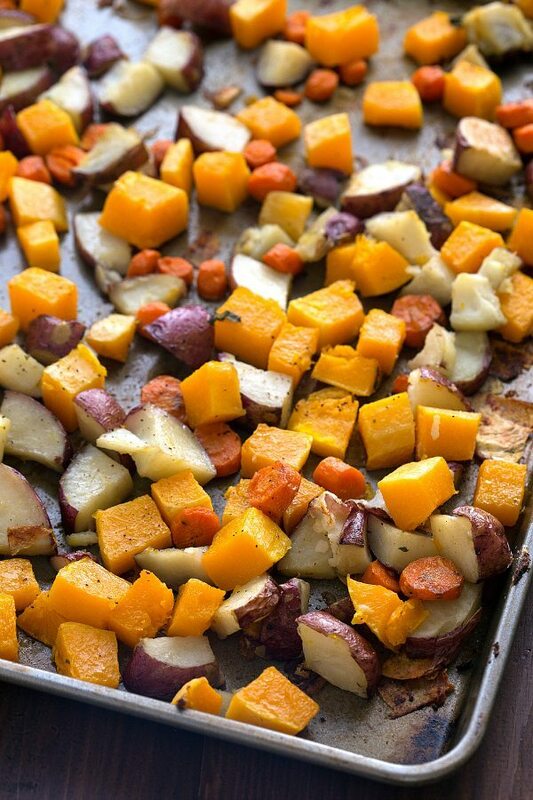 Oh a pan of roasted butternut squash doesn’t last around this house…its out fave as well! And loving all the flavors in this soup. Definitely needs to happen soon! Butternut squash and kale is one of my favorite combos! This soup looks so so good! I have been making soup probably twice a week lately – I can’t get enough! I love soup, because there is always leftovers that taste great or freeze well. It’s filling without being heavy. 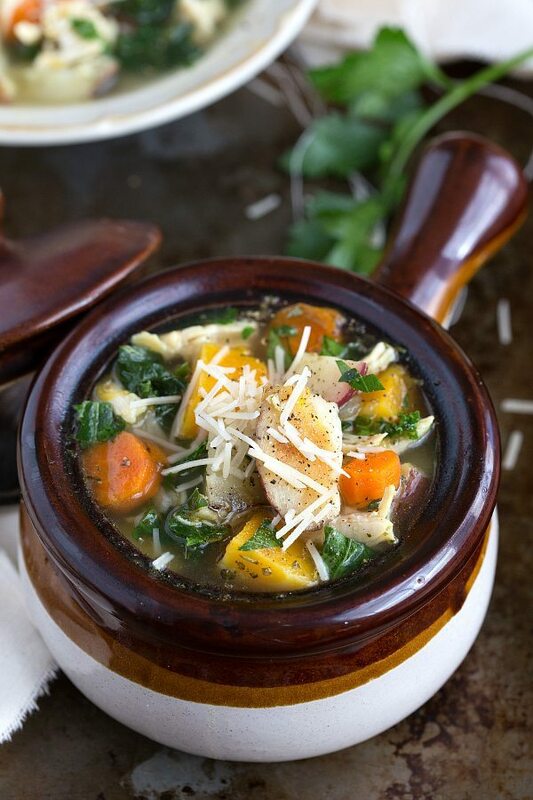 This soup looks incredible – love butternut squash and kale. 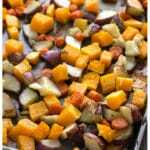 Great idea to roast the veggies first too – I can just imagine how flavorful this is. All the best flavors of fall in a bowl – so so good! Chelsea this soup looks like the answer to my prayers. <3 This cold just WON'T go away and I need all the soup I can get. Wonder if I can get the bf to whip this up for me? 😉 Pinned! This soup is right up my alley! Thanks for linking up with What’s Cookin’ Wednesday! Made this soup for dinner tonight. Although I didn’t have any sage 🙂 It tastes amazing. Love the roasted vegetables and lightness to it. I had rainbow carrots (purple, white, orange), with the dark Kale, orange and red the dish was beautiful. I am wondering if anyone has tried this without the chicken. If I decide to leave the chicken out, should I add something else in order to balance the flavors? I made this yesterday and it was delicious!! Thank you so much for the healthy and flavorful recipe! I’m excited to try some more recipes from your site. I’m so happy you enjoyed this soup Melissa! It’s one of my favorites 🙂 I hope you love whatever you try next!! This is my 5th Chelsea recipe I’ve cooked and I’m now convinced she can do no wrong in the kitchen!! SO flavorful and HEALTHY- my 3 yr old is SUPER picky and LOVED it. Thanks again Chelsea! !